Sometimes a girl has to get away and just pamper her self. A few weeks ago I did just that. 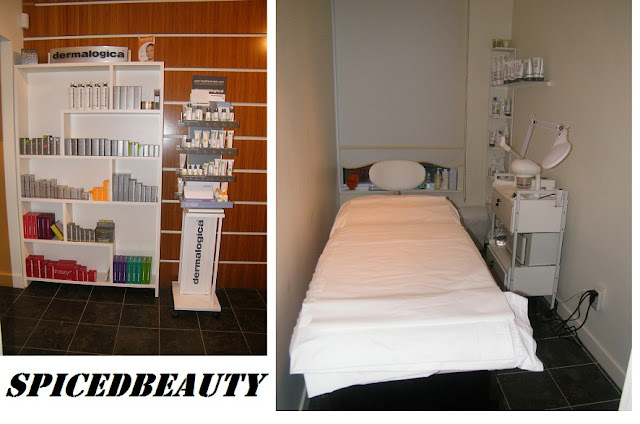 I visited Toronto's only health conscious body bar 1Bodybar for a facial & manicure. Lately, I have started to treat myself to getting my nails done every three weeks. 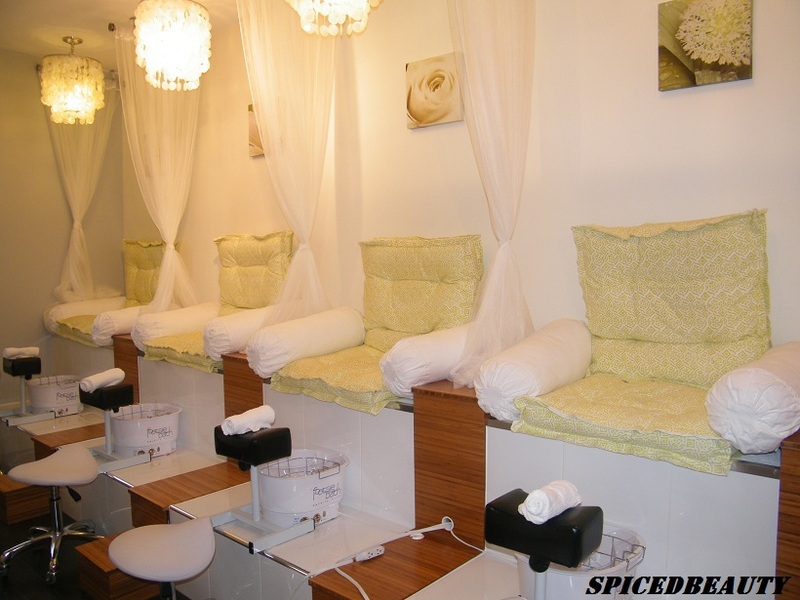 I have been to quite a few salons/spa's in my city but overall I have not been impressed. It's not just about quality but the atmosphere plays a big role too. You should go back because you love it not because it's the only decent place in your area. 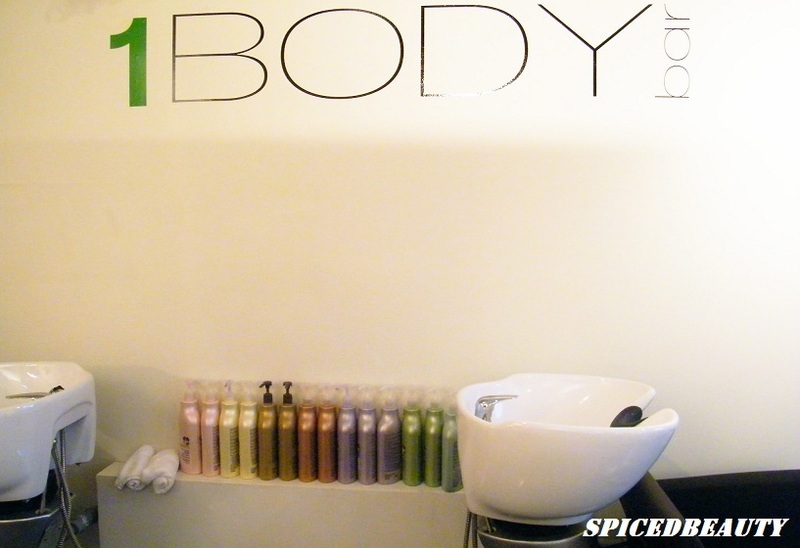 I would totally go back to 1Bodybar because I generally loved the atmosphere. The people there were totally friendly. The lady doing my manicure and I had an awesome conversation about her Channing Tatum encounter. Hahaha! Most of the time when I get a manicure I'm never asked how I would like my nails or given suggestions what would work for me. At 1BodyBar we talked out what shape would go with my nail bed and how to maintain it. I enjoyed the fact that after my manicure I got to keep my nail file and the hand cream she used on me. Although it's a small gesture, it was great to know that everything used was brand new. My "Island" inspired nails for the Summer! The lady doing my facial was very knowledgeable. I should add the facial was done with all dermalogica products. This is a brand I know and use at home. The best part was the steaming, massage and blackhead extraction. I will admit the room which I got my facial in was small. I'm adding this a warning, in case small places make you uncomfortable. You can see a picture of the room below. I would go back to 1BodyBar again if I am in Toronto! 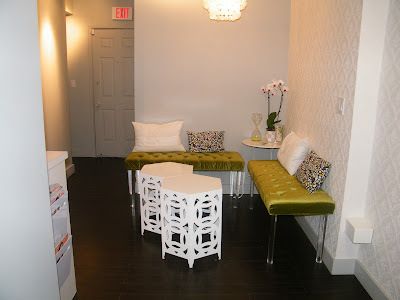 Are you currently in love with your salon or are you looking for a new one? Don't you hate the fact that your hair "soaks" up smells like a sponge! Nothing is worse that leaving the house and fearing that everyone smells that curry chicken that your mother just cooked. Haha- I know I can't be the only one who thinks that everyone can smell it. Now that I'm older, I appreciate a product like Mane teeze. Mane Teeze by T&M Hair Perfumes aim to freshen your hair, invigorate your spirit and unlock your inner diva at any hour of the day. Delicious scents with a higher concentrate than average perfumes adds a long lasting fresh flavour to your hair for up to 12 hours. Social Butterfly gives off a sweet vanilla scent. I like the fact that the scent is not over powering. If you don't like vanilla scented products there are two other options: Black Widow & Haut Mess. Haut Mess is actually my favorite because it's chocolate and caramel scented. In a fashionable 50ml glass bottle, Mane Teeze by T&M Hair Perfumes can conveniently be toted around in your gym bag, purse or clutch. I like the bottle but I wish that they had a travel- sized option. Recently, I went to a BBQ and got the unfortunate seat beside the BBQ. My hair smelled like hamburgers & chicken! Before I left to go to another venue I lightly misted my hair. Since I had a huge bag, sticking it in there was no problem. If I had my mini over the shoulder bag, I wouldn't have been able to fit it in there. I could probably transfer some to my mini atomizer. You have two options to purchase ManeTeeze: Online or at a Blo Blow Dry Bar. How do you deal with hair "odors" other than washing your hair? Beauty boxes are taking over! The most recent box to enter Canada is GlossyBox. I remember drooling over the UK boxes and awaiting their arrival here. 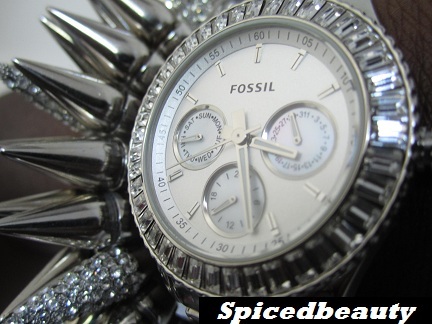 Stay up to date with current trends/discover new brands. Five exciting product samples each month. $15 a month price tag. 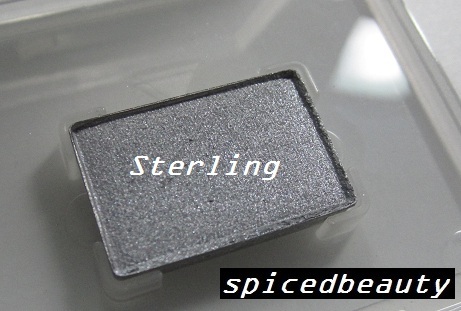 Overall, I noticed that this box is the highest priced out there (in Canada) but after looking at what you can get in the box I totally know why. For example: Full-sized items such as WELLA Ocean Spritz in the June box retails for $16.99 and Ultra Sheer Dry-Touch Sunblock SPF 55 is $15.99. One item basically covers the price of the box. Consider the other four items a bonus! The idea of a 6th surprise item in your box is a great deal as well. 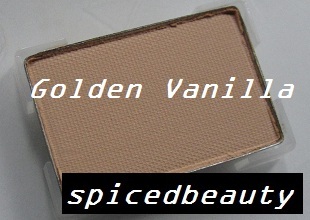 If you love trying out new products and you're on a budget, I would recommend this box. I also want to add that you can cancel your GLOSSYBOX subscription at any time within 14 days prior to delivery. I hate putting stuff like that out there but I have had a bad experience with an American box and it's good to know your opinions. Whether or not you use it.. 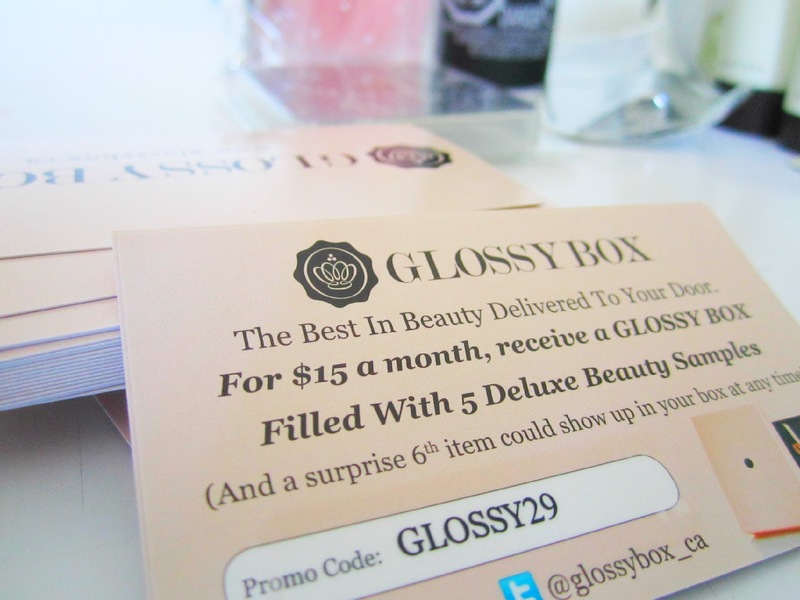 If you're interested in trying out GLOSSYBOX use my promo code: Glossy29 for 10% off! My makeup Stash is growing rapidly. With the addition of new goodies, it's important not to forget about your older products. 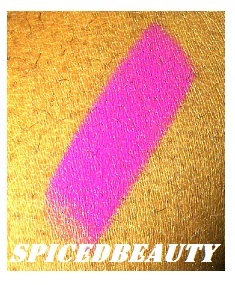 I'm going to start highlighting more of my favorite/unique products. Quick Sizzle hasn't been in my stash for that long but it's the perfect summer color! I personally gravitate to blue based colors like this cause they look best on my skin tone. 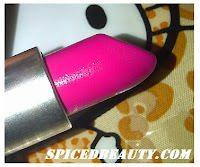 This is my first time trying a fuchsia which is matte. I was really nervous at first but it has a slight "creamy" consistency. Discover The Shopping Channel's Summer Beauty + ebeauty bag! It's that time again! The Shopping Channel's Summer Beauty event. Prices have been slashed and it's the perfect time to try something new! 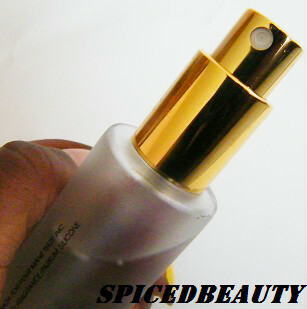 This luxurious Repairing Conditioner helps undo and prevent breakage. The Rio UV Gel Nail System uses technology normally only available in a salon, to help protect your nail polish for up to 14 days. The Damage Reverse Restorative Shampoo and Conditioner Set is ideal for very dry, damaged hair. The Basics: A gorgeous orange cosmetics bag embossed with the eBeauty logo and packed with all the goodies you'll need for fun in the sun. You'll be getting over $150 worth of products for ONLY $30!! Boscia Vanilla Blotting Linens: Finely woven blotting linens that help absorb excess oil and control shine without disturbing your makeup application. Atelier Cologne Orange Sanguine: A zesty, energizing fragrance that plays sweet blood orange juice against bitter orange peel and sensual geranium. 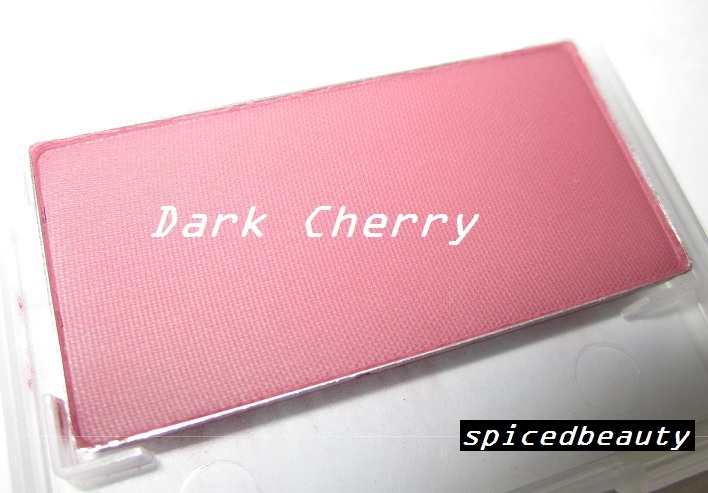 Lippy Girl Cosmetics Organic Mineral Blush: An all-natural, organic blush that brightens your complexion with a natural-looking flush of colour. Mèreadesso Tinted Lip Treats: A highly soothing lip balm that serves as a primer and nourishing lip treatment. NYX Cosmetics Xtreme Lip Gloss: A high-shine, high-impact gloss that conditions lips and moisturizes them with a gorgeous glossy finish. Nail Tek Mini Swarovski Crystal File: The prettiest nail file you'll ever find, it works to seal and protect edges of nails as you file and shape. Cargo Lash Activator Mini Mascara: An exceptional mascara that promotes lash vitality and reduces the loss of lashes while giving you big, beautiful lashes. IT Cosmetics Bye Bye Pores Airbrushed Bronzer: An oil-absorbing bronzer that leaves skin with an air-brushed effect and a golden, sun-kissed glow. Perricone MD Face Finishing Moisturizer: A lightweight moisturizer that works to hydrate, nourish and firm skin's appearance to give it a healthy, youthful-looking glow. I have a love/hate relationship with washing my hair. I love the feeling of clean hair but hate the amount of work that goes into washing it. I know that a lot of people out there can sympathize with me on that. I gave up going to the salon in January. I love my hairdresser but I think that I want to nurse my hair back to being healthy on my own. Maybe when I get to where I want... hair wise, I will go back. With that being said, I need to look into alternate ways of making it look its best. 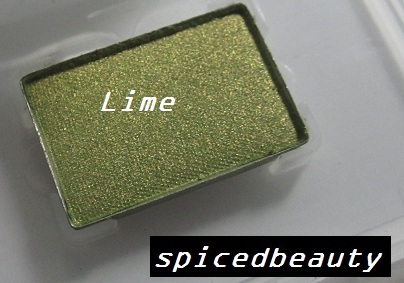 I've tried original and it left a slight matte look that I personally wasn't going for. I would recommend it for someone who is blonde or has lighter hair. Thankfully I did not give up on the brand because they have a dark & deep brown option! It does everything I want without leaving that matte "cast". 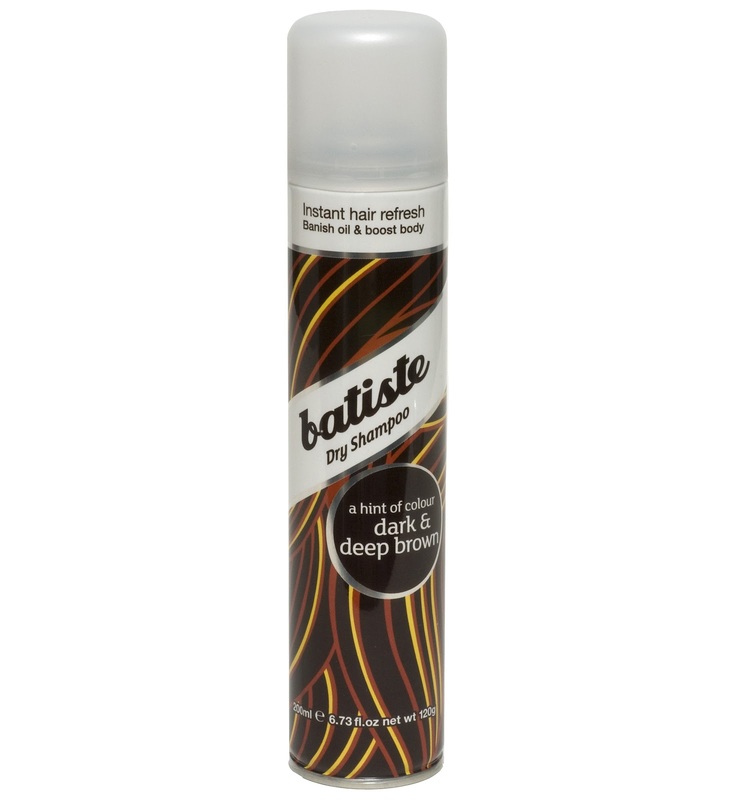 I love the fact that it smells great and it's lightweight on my hair. Lastly, it leaves no residue on dark hair! I know that this is not an alternative to washing your hair! Don't worry, I'll always go back to good shampoo and water but it's good to know that we have options! 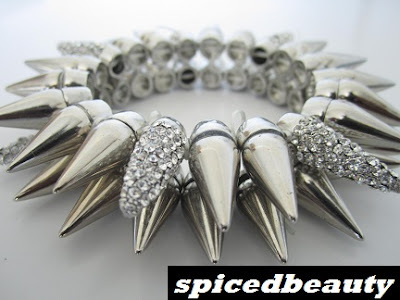 I have been eying this Spiked Bracelet since my last Danity Luxuries order. After I bought my fossil watch, I figured this bracelet would be a perfect accessory to pair with it. 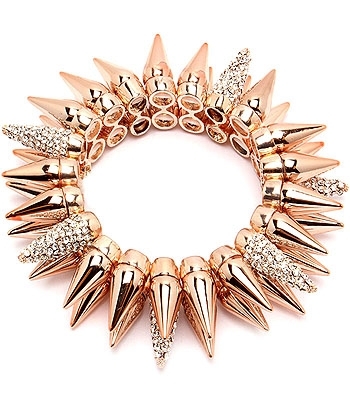 I love it because it edgy, fashionable and unique. I debated between the gold and silver but I think I made the right choice. There are so many concealer finishes on the market now! Foam, cream or liquid- its so hard to choose. I personally prefer liquid because it provides the most natural coverage for me. Now in my 20's I'm blessed to not have extremely dark under eye circles but who know what will happen later on. 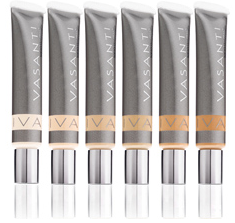 Currently, one of my favorite concealers is Vasanti's Liquid Cover Up Oil-Free Foundation and Concealer. I'm always on the hunt for another holy grail concealer! What is your favorite concealer type and brand? 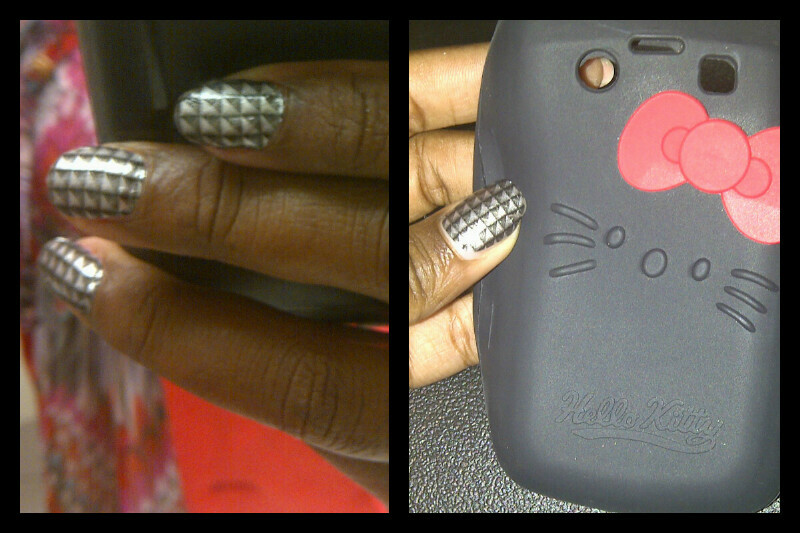 One of my favorite nail inventions is definitely nail polish strips. 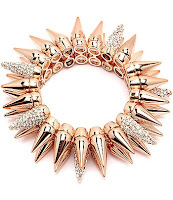 They come in various colors, styles and finishes. I have tried various brands and hands down Salon Effects Real Nail Polish Strips has been the best so far. The styles above are from the Sally Hansen's Collaboration with Canadian Singer-Songwriter Avril Lavigne. Avril Lavigne has partnered with the brand and created 12 new limited edition designs of the revolutionary Salon Effects Real Nail Polish Strips. These distinct rocker-chic patterns representative of Avril’s personality. 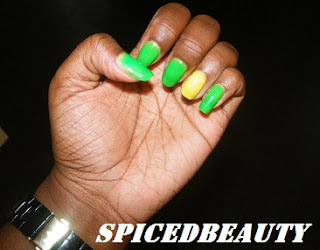 If you aren't very creative with free-hand nail art, this is the quickest option to get the style you want. Each pack comes with two packs of nail polish strips, mini nail buffer, cuticle stick and instructions. The formula is dry but made of real nail polish. It's evident once you peel off the plastic backing. Size each strip to your fingers before you peel off the backing. Once you peel off the backing use the strips quickly because they will dry up. Use nail polish remover to remove the strips. Suggested price is $9.95 CDN. Since I'm obsessed with studs, Stud-io Time was my favorite print. The fine details made it look 3D. It looked like I put little silver studs all over my nails. It was definitely a conversation starter. The number one thing I would suggest is to have patience with these strips. Apply them as close as you can to your cuticle without getting it on your skin. This picture was taken on day 4. As you can see there is no lifting or discoloration of the strips. Each strip is carefully crafted and I think the long lasting factor due to each strip being thin. I've tried another brand that was thicker and by day 2 it either lifted or fell off. In other words it was a waste of money. Overall I am excited I'm very pleased with these strips and excited to try other styles. 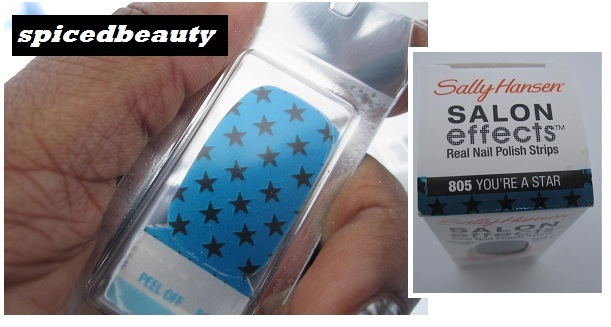 Have you tried Sally Hansen's Salon Effects Real Nail Polish Strips? Mary Kay is one of my favorite brands for eye shadows. Their range of textures and shades is the number #1 reason why I keep them in my kit. It's always interesting to see the reactions of people who I try them on the first time. 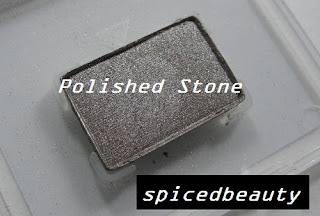 The mineral-based formula is famous for its oil-absorbing properties, ease of application and excellent coverage. Plus, these long-lasting, crease resistant, fade-resistant shades look fabulous on every skin tone. 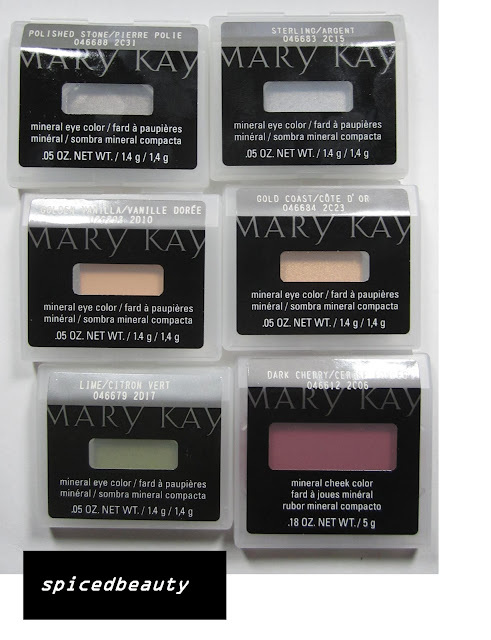 Mary Kay® Mineral Cheek Color lets you do just that. 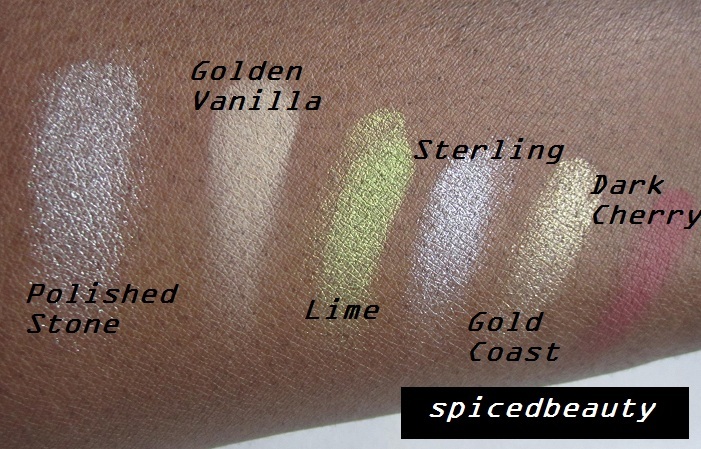 It gives you options that look gorgeous no matter what your skin tone. Customize the fade-resistant colour with a light sweep for a natural blush and then build it as you like. 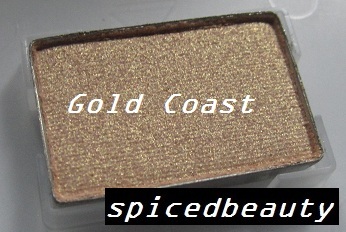 Hands down Gold Coast is my favorite color out of the bunch! I love the range from matte to shimmery textures.